The Waigani National Court refused to entertain an application for an extension on the stay order on the warrant of arrest for the Prime Minister, Honourable Peter O’Neill on Tuesday this week. 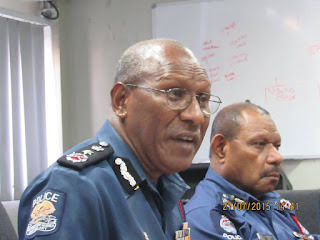 Since then there has been numerous comments made by people from all facets of the PNG community, both in the mainstream as well as social media. Most are asking what action the police will take and when. As Commissioner of Police I welcome the decision of the court as it now paves the way for us to move forward on this matter. Since the Court decision I have had consultations with my senior officers on the case. I want the people of Papua New Guinea to appreciate that this is a very sensitive and delicate matter involving the Prime Minister of the Independent State of Papua New Guinea. It comes during the formation of the government and amid election related clashes in at least three highland provinces which has left more than 10 people dead so far. Against this background there is a need to thread carefully. That being said, by way of background, a warrant of arrest was issued for Prime Minister O’Neill in 2014. A Judicial Review was sought on two grounds, that the Chief Magistrate when issuing the Warrant of Arrest acted without or in excess of her jurisdiction when no information was laid, and that the warrant also did not disclose an offence known in law and departs from elements of offence of official corruption prescribed by Section 87 of the Criminal Code. However, the Court in its ruling on Tuesday rejected these grounds of review and dismissed the proceedings as an abuse of process. The option now open in this matter is for the Commissioner of Police, myself, to invite the Prime Minister to come in for an interview. This is not a requirement by law but an existing and established protocol the Constabulary has engaged over the years for leaders and high profile people. After all, the premise is that everyone is innocent until proven guilty in a court of law and so leaders with standing in the society must be respectfully dealt with. I have had an executive brief on the case made available to me by Director Fraud and Anti Corruption Chief Superintendent Mathew Damaru through Assistant Commissioner Crimes Victor Isouve. It must be appreciated that actions on this investigation leading up to the issuance of the warrant of arrest were taken prior to my appointment as Police Commissioner. In fact I am the second Commissioner in office after the warrant of arrest was issued for the Prime Minister. However, neither myself, nor the previous Police Commissioner have been made privy to or have had an appreciation of the investigation. I will now be engaging my Assistant Commissioner Crimes and Director Fraud and his team to assist me to fully appreciate the case after which I will invite the Prime Minister to come in for the interview.